Snow and ice in March put the brakes on construction work at CAST, and the thaw brought an unwelcome crop of burst pipes. However, the construction team are now hard at work again and making good progress. The first fit of new services has been completed in the café area, ready for the joiners to start on the new counters and bench seating. 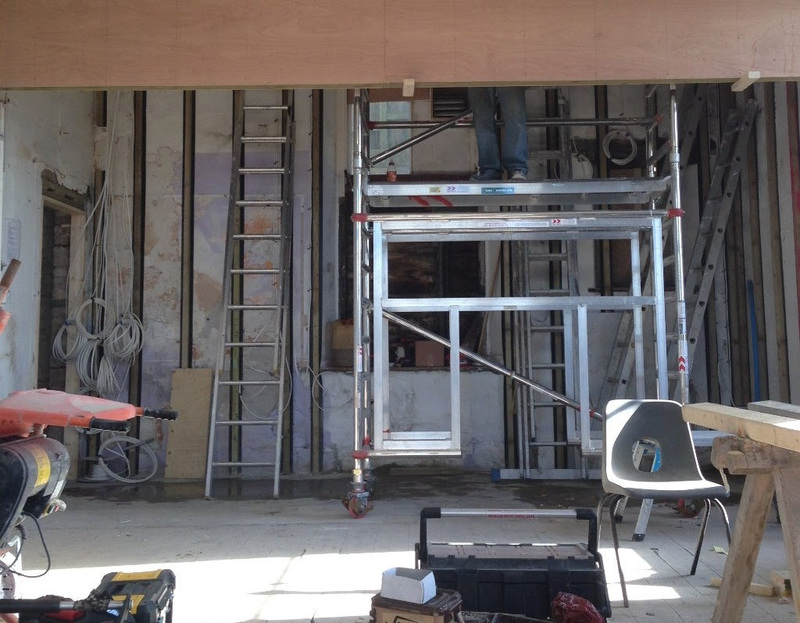 At the east end of the building, work has begun to create a new block of toilets in what was the old school kitchen. Outside, a comprehensive groundworks operation has given the café end of the building a new fit-for-purpose drainage system, and pipework has been laid for a new gas and water supply. Old brickwork from inside the building has been used to form the base of what will become the new outdoor terrace. This first phase of work will be completed in time for the launch of Groundwork on the first May bank holiday weekend, 5-7 May. Groundwork is a season of exhibitions and events by internationally celebrated artists working with moving image, sound and performance, presented in special locations across West Cornwall. CAST will be the hub of the programme and will present a series of moving image installations in a specially constructed black box space with exceptional high definition image and sound quality.